What's often left out of the Nyerere-centric narrative of Tanzanian nationalism is the contributions of Muslim townsmen. 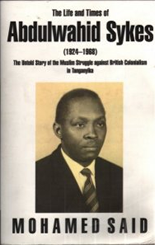 Back during my first trip to Tanzania in 2006, I went with a friend to the Maktaba ya Taifa in Dar-es-Salaam and happenned across Mohamed Said's book on Abdulwahid Sykes. It came as a revelation to me that Sykes and other Muslim leaders in Dar had been the impetus and the organizational core of the Tanganyikan African Association, the organization which would eventually become TANU. The book is a chronicle of that struggle, and Mohamed Said is anxious not to allow his readers to forget this 'underground' history. Eid Mubarak to Azanian Sea Readers!